World War II era map of Indonesia. 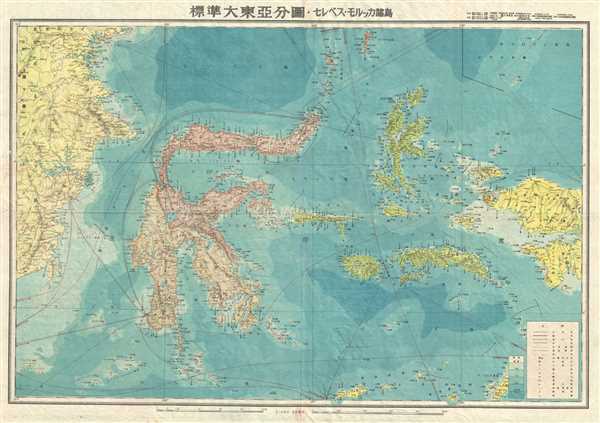 This is a scarce and beautiful 1943 or Showa 18 large format Japanese map of Sulawesi and the Maluku Islands of Indonesia. It covers from eastern Borneo east to include the islands of Sulawesi east as far as West Papua. It offers superb detail regarding both topographical and political elements. Notes cities, roads, trade routes on air, sea and land, and uses shading to display oceanic depths. Very good. Minor wear along original fold lines. Minor toning and spotting. Accompanied by original cover no. 13.